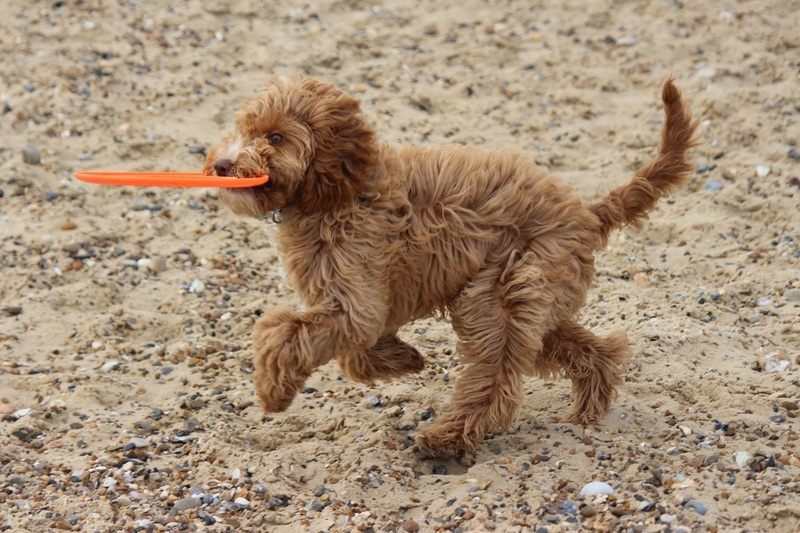 The first 12- 16 weeks are an important part of your pups development period and during this period is the crucial time for you to implement the socialisation of your puppy, to help your puppy grow into a confident and secure and happy dog. During this time frame your puppy is more receptive and less fearful, after 12-16 weeks they then know what fear is and may find new situations scary, so best to invest time now to start to prepare your pup to the world he is going to live in. This means that positive experiences with different people, places, noises, situations, other animals etc..... will have a positive effect on the sociability of your dog. 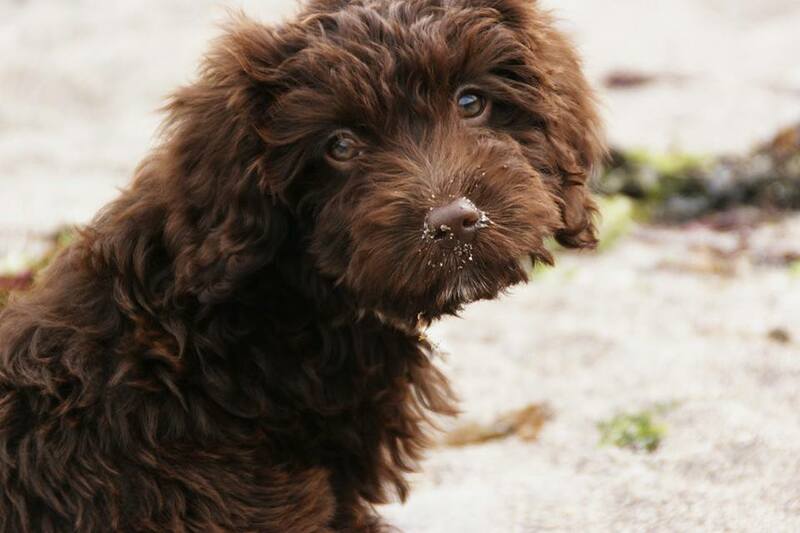 Hopefully your breeder will have started preparing your puppy by exposing it to the usual household noises such as the hoover, washing machine , TV and other household noises as well as the daily hustle and bustle of family life. Once puppy goes to your home it is essential this work is continued and your puppy is safely exposed to as many different experiences as possible both inside the home and outside. Take your puppy to places where he can experience car travel, traffic, crowds, towns and countryside. However take your time and do not overwhelm your puppy with lots of new things all at once. Watching TV...already looking like a fan of Eastenders ! Gradually introduce your puppy to a variety of household nosies such as hoover, washing machine, dishwasher, hairdryers, TV, Music etc... You can buy desensitising CDS with household noises to help with this, some will include fireworks or CDs especially for loud noises, useful if socialising your pup during firework season. 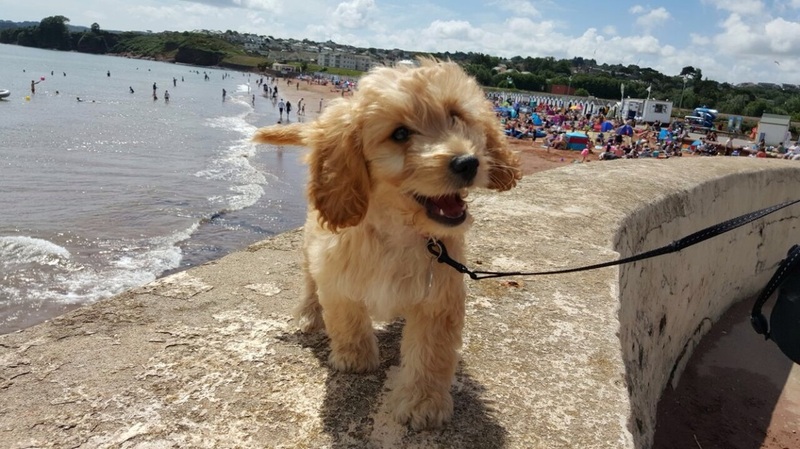 At the start of socialising your puppy,outside adventures will be restricted until your puppy has completed his vaccination course, you will not be able to walk him outside on lead on the floor. However socialisation can begin by carrying you puppy out and about so he can get used to outside noises, people and different places. Meeting new people, some may be wearing hats or have beards,or in uniform etc... all these are preparing your pup for the life outside of his home. When pup is meeting new people , get the person to give them a treat so they associate meeting people as a positive experience. Though be prepared to be stopped often as everyone will want a stroke or a cuddle! 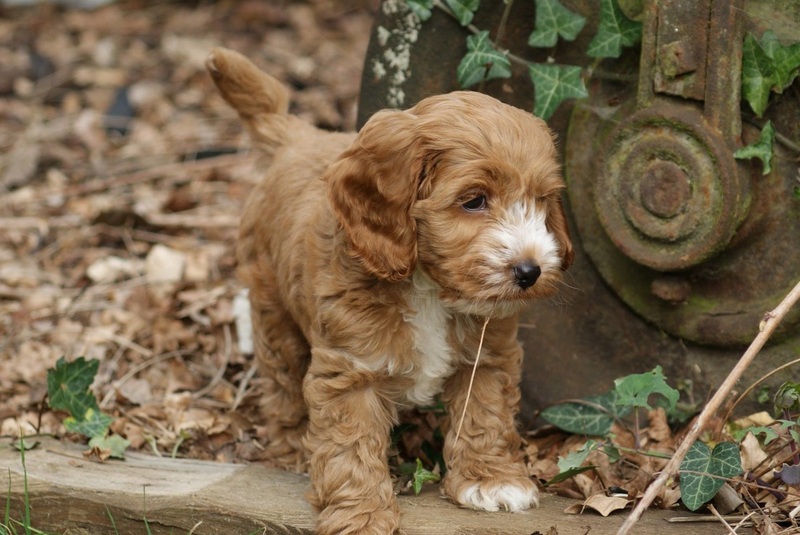 Who can resist the cuteness of a cockapoo pup. You can also buy puppy slings to carry them and puppy strollers. Even going to vets can be included as part of socialising...meet new people, new environment and being handled and the smell of the vets and of course other animals in the waiting room. Allow your puppy to approach new things at his own pace.You can use treats and praise to encourage your puppy to approach unfamiliar people, places and objects. Never force him or push your puppy past his comfort level or he may become fearful of the things you are trying to get him to accept. Puppy Parties : Your vet may hold puppy parties at their practice, which allows owners of all breeds of puppies to get together to meet each other and for their dogs to meet in a controlled environment. If your vet offers them get as much information first, so that you feel it is right for you such as being well organised and not over subscribed. 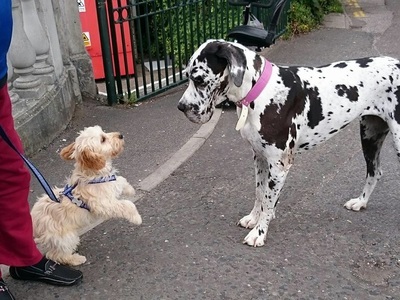 You may also know of other owners and arrange a get together at your own house, or a meet via getting to know members of the club with puppies same age in your area. A great way for both of you to make new friends. Once your puppy has had it's full vaccination course you can then start exploring the outside world together. First walks are so much fun. You may have to get used to puppy wearing a collar and lead round the house first before venturing outside. Coax puppy along with lots of praise and encouragement and his fav treat. Remember it's all new to a pup so he will need time to get used to the collar and lead and walking outside but he will soon learn it's so much fun! There first encounter with snow is a joy to watch. 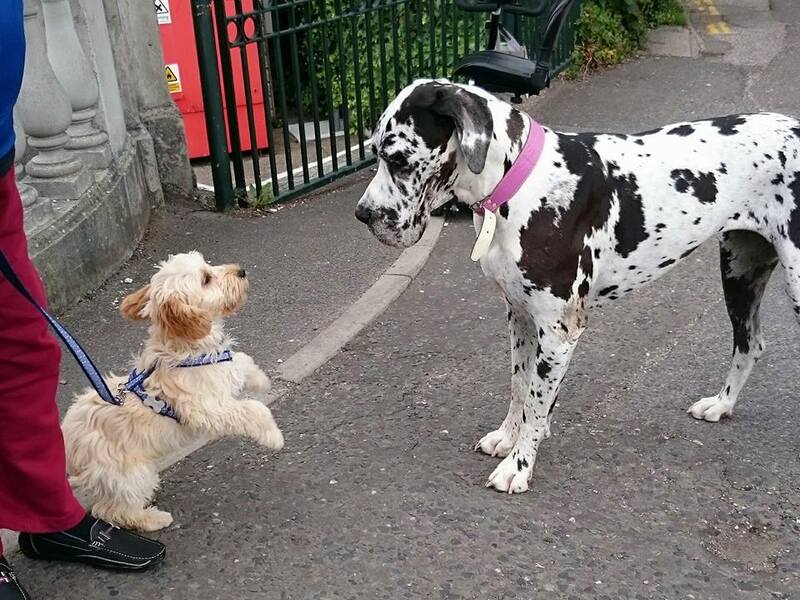 Getting to meet other dogs, even ones so much bigger! Puppies should meet a variety of other animals. Keep the safety of both animals as priority.Keep your puppy on a lead when meeting animals that are not yours, to prevent puppy from wanting to chase or harass other animals and always observe the laws of the countryside when meeting farm or wild animals. Puppy Training classes: These are a good way to not only learn basic skills such as sit and stay, loose lead walking and recall but are also a good way to socialise your pup: new environment, new people and new dogs to encounter. There are usually various levels from Puppy foundation course to awards in training such as Bronze, Silver and Gold where your dog has to learn various skills, which increase at each level. We recommend you pick a trainer who uses positive reinforcement training. He will start exploring , having lots of fun sniffing and about and investigating. Do however ensure it is safe to let your dog off lead and be mindful of others. 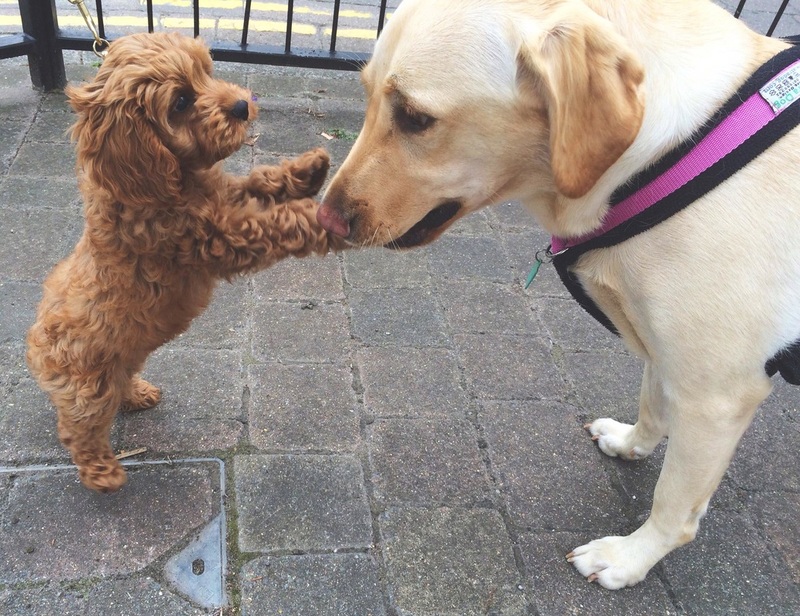 Meeting up with others on organised Cockapoo Owners club walks, another great way to socialise for both puppy and owner alike. Woods are great, lots of trees and the rustle noise of leaves..watch out for the bunnies, deer and squirrels though! Parks have a wide variety of new exposures, walkers, children playing, kite flying, cyclists, people having picnics and lots more .There will also be areas of grass to zoom around on and areas with flowers, all new sensations and smells to the inquisitive pup. Though always remember never to force your pup to enjoy these things, take time to introduce and go at your pups pace, give positive reinforcement and praise so he knows not to be scared. 1. First get them into the car and onto the seats on a car that is stationary. Reward with treats and praise or you may need to entice them in with their favourite toy, depending on the stress levels. 2. Keep doing this till dog is comfortable and then progress to sitting in the car without engine running. 3. Then follow this up by sitting in car with engine running. 4. Then do shorter journey. 5. Then progress to longer ones. You may need to take frequent rest breaks. Socialisation also continues inside the home too getting pups used to visitors inside your home both expected and unexpected, as well as continuing to get comfortable around household noises. Having bath and groom is another good experience as it's get puppy used to being handled. A lot of groomers offer a puppy brush up and trim another worthy experience in socialisation development. 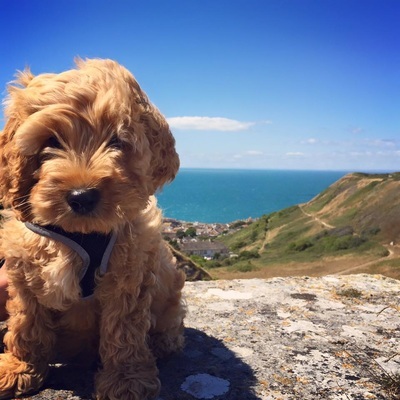 By providing your puppy with the safe opportunity to new places and new things, you allow him to become secure and confident as he grows and develops, as the world can be a big scary place. We hope you enjoy the time you spend together as this is a great time for bonding too, explore the world together you and your furry cockapoo pal . "Come on then Buddy what mischief shall we get up to today then ? "